The following five rare and unique synthesizers weren’t very popular, but their scarcity and uniqueness make them even more valuable today. Being a newly, self-declared synth geek, I’m enjoying the process of learning a new instrument. It’s nice to know there is even more money to spend on audio gear than I had previously thought. 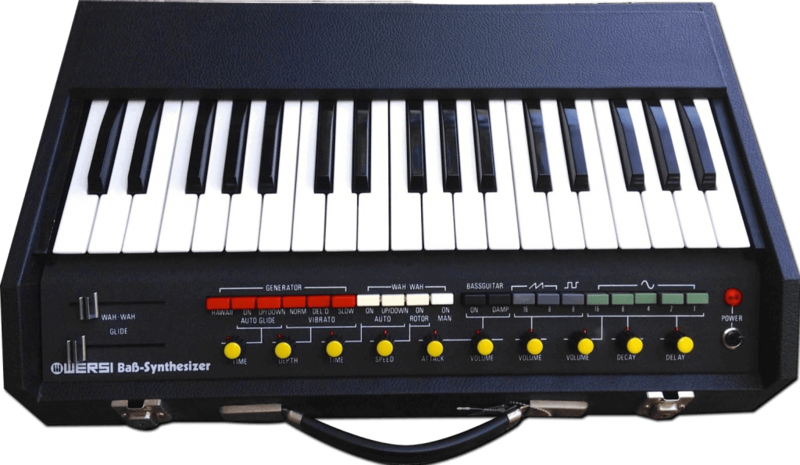 We’ve all heard of Junos, Prophets, Arps and DX7s but what about the synthesizers that weren’t as popular? I think it’s fascinating to think about the smaller run projects and how they were all at one point the culmination of someone’s imagination. Unfortunately, not all synths had as much widespread appeal as some of the industry staples I mentioned earlier. There are many reasons a synthesizer might not do well commercially, whether it be faulty components, a bad user interface, or just failed marketing efforts from the company, most of the time it has nothing to do with the actual sound of the instrument. Wersei is a German digital organ maker who is still in business today. They were one of the first Organ manufactures to embrace digital technology. After ten years of producing Organs, they decided to try their hand at synthesizers and entered the market with the EX20 module, a digital 20 note polyphonic synth. The sounds from this synth are based on an arrangement of modules such as wave, pitch-envelope, amplitude envelopes and analog effects to produce fourier, waveform sample, and modular synthesis. There’s also an EX-10 model that looks similar and uses cartridges; however, the cartridges are not cross compatible and are extremely difficult to find. Owners and users of this unit say they are incredibly challenging to program and nearly impossible without the manual which is entirely in German. 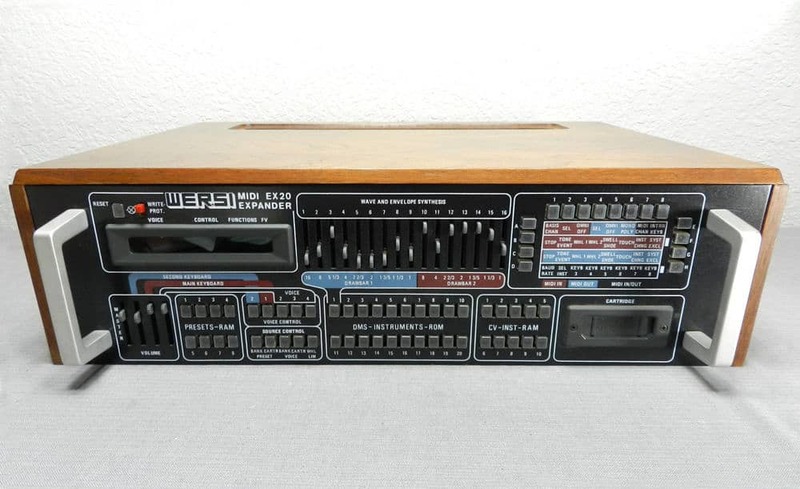 Wersei made some other unique synths that are just as rare including the Bass Synthesizer and the Stage Performer Mk1. In this interview with talented synth programmer Wolfram Franke of Waldorf Synthesizers, he talks about the ES20 and some of the unique features. “It’s from the German organ company Wersi and it is called MK1 (Series III). It was a 20 voice, 8 part multitimbral additive synth with up to 32 harmonics, an integrated chorus/ensemble effect, and only one VCF, but that one was a copy of the Moog 24dB VCF plus a good-sounding overdrive. It had a lot of very interesting features that you won’t find in any other synth like modular envelopes with 8 stages where each stage could hold a module that did something like generating random steps, vibrato, linear or exponential ramps or simply holding the level for a certain time. The first unique thing that sticks out about this synth is its 93 keys which are just two 4-octave synths connected. “Unlike any analog or digital synthesizer’s controls, the patented tone control consists of sixteen steps simply outlining the waveform as set by the Signal Controls you see at the left of the control panel. Similarly, the envelope and filter contour transients and their time intervals are also set by the Signal Controls for rhythms or extended notes. You may easily add prompted, parallel voicings, combining settings of both sides for complex notes. 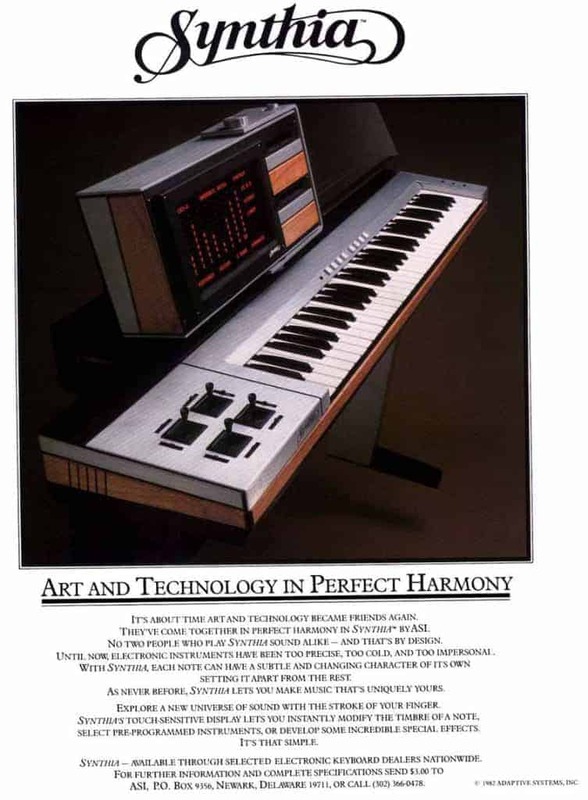 Synthia was a very rare “all in one” high-end synthesizer released in 1982 by Adaptive Systems, Inc. These units started at 20,000 which may be why there aren’t many people that have ever seen, let alone played a working one. There aren’t even any sound clips or video demos posted online anywhere. I wish there were videos or recordings of this one so I could verify this claim, but I guess I’ll just need to use my imagination. These premiered in the form of two prototypes at the 1982 NAMM show. The prototypes did not sell and soon after manufacturing ceased. The synthesizers are currently not functioning and sitting in the basement of the inventor, Mark E. Faulhaber. One unique feature that would warrant the incredibly high price tag was the touch responsive plasma screen which at the time was very new technology but is now seen in just about every modern all in one keyboard. The plasma screen followed the user’s finger which could be used to adjust bar graphs that controlled the different adjustable parameters on the synth like harmonic content, envelope parameters, controller assignments and more. Most of the information on this synthesizer is from the book Vintage Synthesizers by Mark Vail. The Novacord is considered to be the godfather of the modern polyphonic synthesizer. 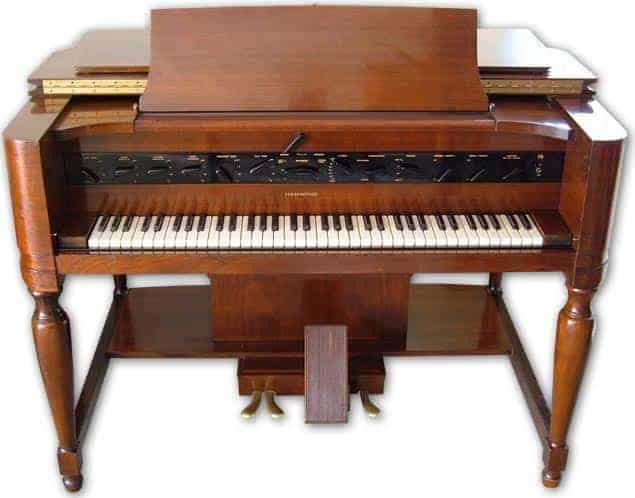 The Hammond company debuted the instrument at the 1939 World’s Fair only four years after the invention of the tonewheel organ. These synths included many features that are now standard in polyphonic synthesizers, like the use of subtractive synthesis. This behemoth of an instrument was truly a marvel including more than 150 vacuum tubes, over 1,000 custom-made capacitors, two 12” speakers and a power amp. Everything was housed beautifully in a wood cabinet similar to that of the more popular B3. Due to the demands of World War II and the lack of sales and parts, c production of Novachords ceased in 1942. One of the reasons it did not translate well during the time was organists and pianist had a hard time playing it as it was better at making more ethereal sounds rather than recreating the more familiar sounds of a piano or organ. An estimated 200 Novachords are still in existence and even less are operational. The name F-I-Z-M-O comes from the five real-time control knobs on the unit, “F” adjusted the effect modulation, “I” adjusted wave modulation, “Z” adjusted filter cutoff, “M” adjusted the detuning, and the “O” parameter changed based on the preset. Problems with the synth that lead to its demise were the unfinished operating system, clunky user interface, and issues with the power supply. Another problem was the look of the unit made people think it was similar to the other analog synthesizer of the period, but it was challenging to create classic “analog” sounds. The Fizmo was mainly known for its atmospheric and ethereal sounds. 500-2,000 of these synthesizers were estimated to have been produced.